A whole bunch of stuff to get to, so let’s not waste any more time babbling on or apologizing for yet another post that took forever to get out, shall we? First up, good news on the latest book project we’ve been working on. Fear’s Sharp Little Needles, a vast collection of small, modern day scenarios for Call of Cthulhu by Stygian Fox, has finally been sent to the printer for approval (the .pdf has already been released to Kickstarter backers. I won’t go into details, but goddammit, it was another last minute struggle to get the files to play nice with the printer. Adding to the delay were a few rounds of editorial corrections and typos that needed to be fixed (I think at one point I had a list printed out that was 27 pages long). At any rate, I’m hoping we’ll get the proofs back soon and be able to approve them, and get the physical book into people’s hands. Second, we found out that Hudson & Brand has been nominated for an ENnie award! H&B is up for Best Electronic Book (why, you ask, when it’s out in physical form? Apparently there was some misunderstanding between SF and the GenCon committee), and a bunch of other Call of Cthulhu and Delta Green products have been nominated for a number of awards as well. It’s pretty amazing that both games are dominating the awards field this year, and it’s a testament to the outstanding quality from both companies. Meanwhile, work slowly continues (when I have the time) on the artwork for the new Feed the Shoggoth! expansion. I want to get the final pieces at least 75% done before I go live with the Kickstarter, as I refuse to have a huge lag time between the KS completing and actually going to the printer with the expansion. I’ll post another piece of art here soon. 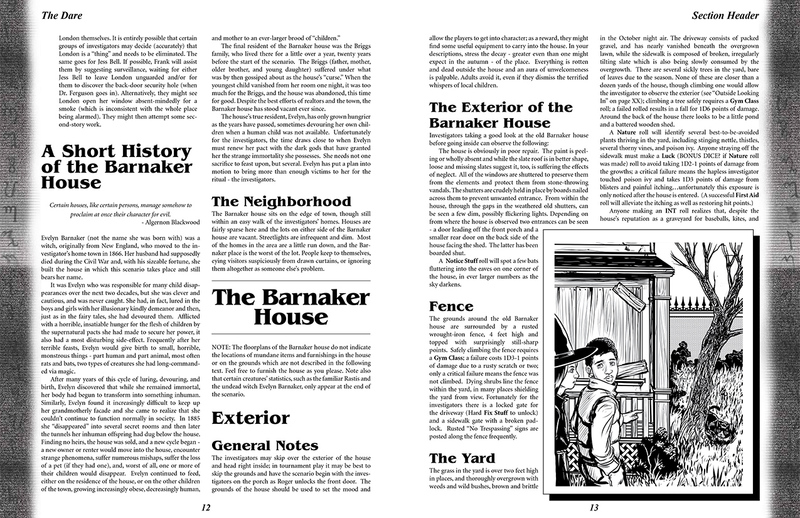 One challenge with The Dare so far has been attempting to accurately nail down which fonts are going to best emulate those that were used during the period of Chaosium’s “Golden Age”. 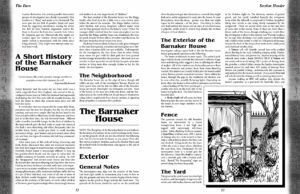 If I remember what Charlie Krank told me, back when I was freelancing for him and visiting the Chaosium offices, they were probably using something like PageMaker. 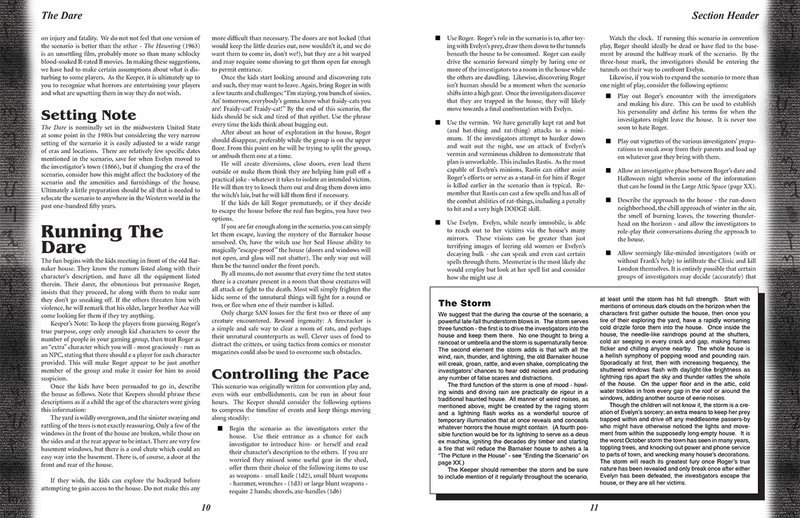 Or possibly doing all the typesetting and such by hand, using some early variant of HTML-type tagging. Whatever the case may be, there’s no concrete reference files that I can use, so I’m basically eyeballing everything and winging it, keeping in mind the relative lack of fonts back then (which means no Papyrus then…*snif*). 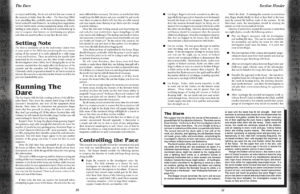 For example, with that boxed text on the right page, it took a bit of trial and error to figure out the fonts for the header and main text (which ended up being Helvetica). As you can see, the lightening of the page decoration helps, but I might wash them out a little more. And something else that I didn’t notice until I processed this latest example is that the page numbers are way, way too close to the bottom edge of the pages. Not to mention that there isn’t enough space between the numbers and the columns of text. This is even more problematic on page “13”, where that image is bumping right up against the number. This required me to both move the numbers up on the master pages, but also adjust the lengths of the columns as well. A minor fix as far as time went, but an important one. Right now, I’m awaiting the rest of the art to come in, as well as the maps. I’m hoping to have the of those elements soon.